The Flock can be configured to track from one to four sensors simultaneously with one or more RS-232 interfaces to a host computer. Long range coverage is easily added by "clicking in" our Extended Range Transmitter (ERT/ERC). For high speed operations, add more RS-232 ports and use our Fast Bird Bus (FBB). No reduction of measurement rates. Track up to 4 sensors at a range of up to 3.05 meters. *Accuracy verified over range from 20.3cm to 76.2cm. 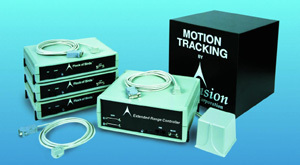 Flock of Birds is a general-purpose motion tracker suitable for many applications. Biomedical references in this document are examples of what medical companies have done with Ascension trackers after obtaining all necessary medical certifications. Ascension trackers are not certified for use in medicine without the end user/OEM complying with all pertinent FDA/CE regulatory requirements.